We are heading back to Peru. 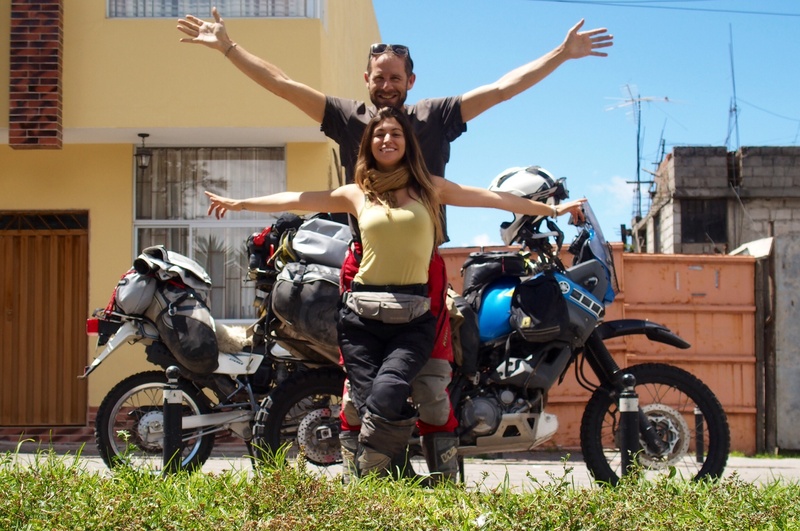 During an enforced four-day halt in Quito as I awaited two parcels containing moto kit, we reassessed our situation and decided that a slow ride back to Lima was our best option. We are now a day from the border. 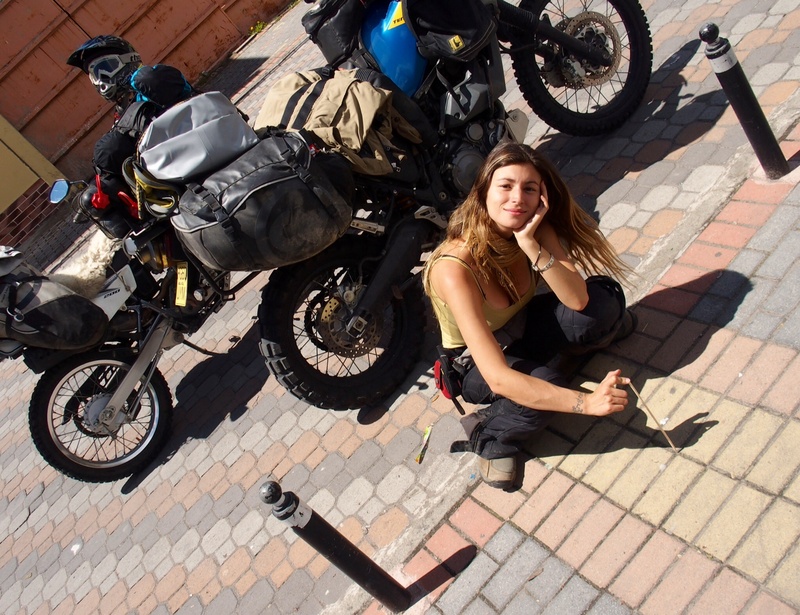 Several factors came into play when making this plan, but most importantly Pau needs to get her moto back to Chile. Chilean customs insist that a vehicle leaving the country must later return. And furthermore, Pau is getting low on funds, so selling the moto in Chile is important. Two months more on the road simply isn’t financially viable for her; even a four-week loop around southern Colombia, before returning to Peru as we originally considered, isn’t an option. And if we are honest, we miss the people, the weather, the dusty mountain tracks and the spirit of Peru – so we are happy to be returning. Having made the decision to return, we nevertheless felt that we needed to reach a significant landmark to indicate our most northerly point. 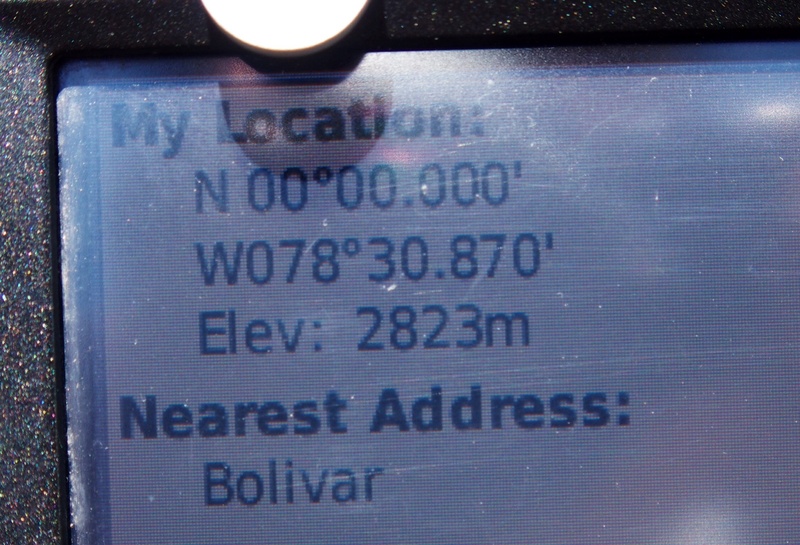 Being in Ecuador, we didn’t need to look far – the Equator lies just a few kilometres north of Quito. So yesterday, on the first sunny day for about two weeks, we loaded up the motos and set off through the frenetic streets of the city, destined for this mythical line on a map. However, here in Ecuador it isn’t just a line on a map – at the huge monument on the edge of Quito’s suburban sprawl celebrating the ‘Mitad del Mundo’, they have conveniently marked it on the ground for the hoards of camera-toting tourists. The only problem, however, is that it has since been discovered that the line is not exactly at Latitude Zero, so the plan was to trust my trusty GPS. The day before, as Pau and I had discussed whether the trip through the chaos of Quito would be worth it, I had cynically observed that from a purely experiential perspective, standing on the Equator would be no different to standing anywhere else in the Ecuadorian highlands – except for the company of tourists and the overpriced gift shops which would inevitably accompany the experience. However, I have to confess to feeling a sense of excited anticipation as I watched my GPS counting down towards 00.00.000 as we progressed north. After an hour riding we were close, then the road turned due north and the last couple of minutes accelerated towards zero. Then the moment caught me by surprise. I was on the Equator, and what’s more my expectations of the previous day had been correct – it wasn’t some special, mystical place, but rather I found myself stopped just short of some roadworks on a busy, dirty road. Hav ing given the Mitad del Mundo monument a miss, and being somewhat underwhelmed by my first encounter with Latitude Zero, we decided to drive a few kilometres through the Northern Hemisphere to a village where another smaller monument (and the original one, I was told) marks this invisible line. It turned out that this monument is also a couple of hundred metres off the mark. As we drove through the narrow back streets of the village, following the GPS, we found ourselves in the sleepy plaza when all the noughts reappeared. On the pavement that borders the plaza, at the exact spot where I had stopped the moto, were four rows of differently coloured bricks. We assumed this was an understated indication of the Equator’s location, but when we mentioned it to the patron of a cafe situated only yards from the spot he knew nothing about it, professing that he had always believed the equatorial line to be marked by the nearby monument. Obligatory photos taken, we returned to and then through Quito, stopping for the evening in Latacunga. We had stayed in the same small hotel a week previously, whose owner had served 25 years in the Ecuadorian Army. When we returned, he greeted me with a comic salute. Once again our surroundings have changed dramatically in the space of a couple of hours. We are on the coastal plain, nearly at sea level having crested 3800m this afternoon, and surrounded by banana plantations for miles and miles. Its hot and humid down here, and the local vibe is gritty and industrious. We push on tomorrow, back to Peru for the third time. I wish I knew earlier – I’ve spent about three weeks in that lovely city over three separate visits. I probably won’t go that far south this time, but you never know! Great write up Mr Pitchfork. I also have a Tenere and plan on doing something similar. Do you carry extra fuel with you, or is 23 litres enough in South America? When I was down in Argentina and Chile I routinely carried 4 or 7 litres spare. Distances between gas stations can be much bigger (especially if you red the back roads across the Andes), and stations in Argentinian Patagonia routinely ran out of gas. Peru, Bolivia, Ecuador – there is gas at every turn. Carrying extra was more peace of mind than necessity – if you know you’re going to do a long leg, you can always fill up two 5L water bottles. Hi I was talking this week with my family relatives and friends in Colombia in the way to assist you as soon as arrive to that country. As I see you took a wise desition. Just have forever in mind, here you have a friend a family waiting for both of you anytime…. My best wishes Paul and Pau…. Paul Pitchfork posted: "We are heading back to Peru. 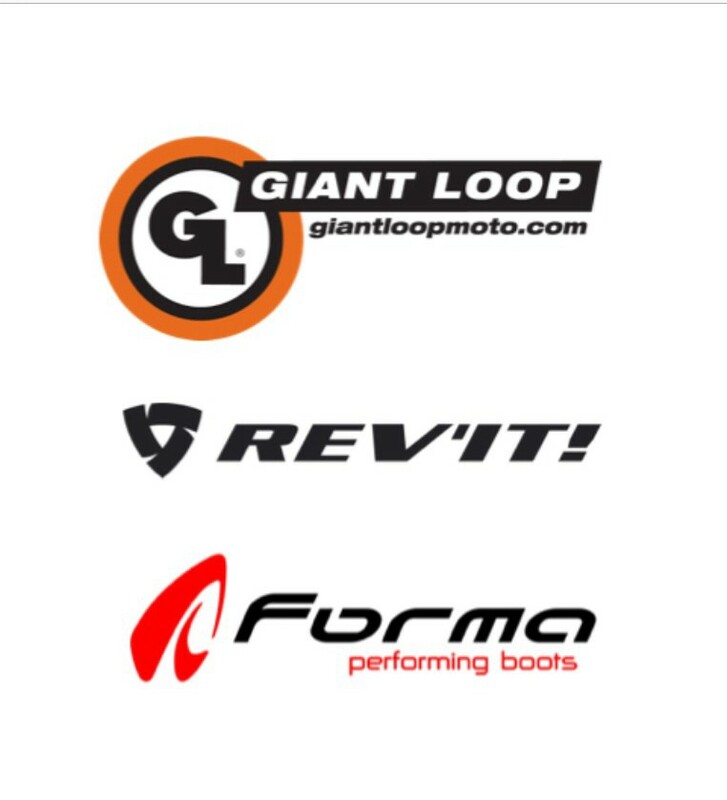 During an enforced four-day halt in Quito as I awaited two parcels containing moto kit, we reassessed our situation and decided that a slow ride back to Lima was our best option. We are now a day from the border. Zaid, my friend. I hope I shall be returning to Ecuador and Colombia after my trip to UK (but unfortunately without Pau), so perhaps we shall meet again. I suppose I can at least tell the grandchildren one day that I stood on the Equator!!! Saheb, it seems like you are having a wonderful time. Suresh Hajur. I’ll be in UK in July – August. Perhaps a visit to RMAS to see you for lunch. Is Mahendra still there?.